Some geometry algorithms depend on searching a fixed set of 1-dimensional intervals for the ones which contain a given value. An example is Point-In-Polygon testing using the stabbing line method. In cases where the algorithm needs to be run multiple times for different input values, the performance can be improved if a suitable data structure is used to increase the efficiency of search. It indexes a static, pre-known set of items. Once built the index cannot be modified. The tree contains two types of nodes: leaf nodes, which contains the stored intervals (and any additional user-specific information), and interior nodes, which contain an interval and references to two child nodes which lie in that interval. sort all the intervals to be indexed by their midpoint. These form the leaf nodes of the tree. Create new interior nodes for every adjacent pair of nodes, assigning the new node to have an interval which spans the intervals of its children. If there is only one child available, do not create a new node for it. Recursively repeat the previous step, until a single node is created. This is the root node of the tree. traverse the tree in depth-first order, pruning branches which have intervals which do not intersect the query value. A nice aspect of this data structure is that it is simple to build. It should be possible to implement the structure using two arrays, one for leaf nodes and one for interior nodes. This should provide a pretty efficient and straightforward implementation in C.
The interior node definition can easily be generalized to allow n intervals per node (the bucket size). Of course, there's a trade-off between increasing fan-out and decreasing selectivity. It's not obvious to me where the sweet spot is. Really this is a 1-dimensional version of Leutenegger & Edgington's STR tree. JTS even contains an implementation of this, using the generalized STRtree classes already in JTS. The novelty here is the exploration of just how simple the implementation of this structure can be. A simple implementation should be faster to build and query, as well - this is a subject for some performance testing. There are several (lots?) 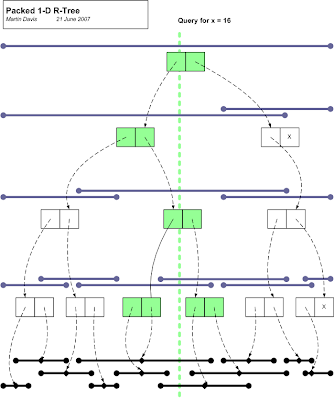 of other data structures for efficiently querying sets of intervals. The segment tree and interval tree are probably the most well-known. Both of these structures are more complex to understand and implement, I believe. In addition, I don't think that they are amenable to an implementation based solely on two simple arrays. The JTS Topology Suite is one of the most widely used geometry libraries for Java. This talk will review the standard geometry methods in JTS, with an emphasis on their finer details. Some of the additional algorithms and components which the library provides will be discussed. Tips for improving performance and techniques for accomplishing various kinds of geometric processing tasks will be presented. The talk will conclude with an preview of some potential future developments for JTS. The B.C. Corporate Watershed Base is a large-scale database of hydrographic information built using open source products. This talk discusses the development of an open source system for automated delineation of watershed boundaries based on CWB hydrography and a terrain model. If previous years are anything to go by, this conference should be very informative and energizing. See you there! JTS and GEOS have attained a certain prominence in the open-source geospatial world. Sometimes comments are made which make assumptions about their goals and project structure which indicate a lack of knowledge about the true situation. Time to set the record straight! The legal attribution of code provenance bears little relationship to the true origin of the intellectual property incorporated in these projects. It seems only fair that the people who actually contributed to these projects have their participation recorded. As the designer/lead developer for these projects, I have the most knowledge about their origin and history. JTS is the result of the fortuitous convergence of two situations. The first was that I had been working on spatial algorithms since the mid-90's. At that time I held a position in the BC Ministry of Forests, with a major focus being geomatics and spatial data management. While there I developed algorithms in C++ for polygonization and the beginnings of a polygon overlay algorithm. These were based on a simple spatial data model and included implementations of several fundamental computational geometric functions. A colleague, Brian Howden, was very encouraging in this work. Brian and I both felt that what the world really needed was a good spatial library, and this motivated me to start packaging my code as a reusable library. However, progress was slow and I did not feel like I had a clear idea of what such a library should look like. Moreover, library development in C++ was quite painful, since it requires such painstaking attention to details of memory management and code structure. The second situation was my connection with Dr. Mark Sondheim, of the Geographic Data BC (GDBC) branch of the BC Ministry of Environment, Lands and Parks. I had known Mark since the early 90's, and had interacted with him on numerous occasions while I was working for the BC Government. Over the years we had many stimulating discussions about geospatial processing, and shared a similar interest in increasing the accessibility and formality of spatial data processing. The JTS Topology Suite formally started life as a project conceived and initiated by Mark. The name and acronym were his idea, as was the concept of using the OGC Simple Features Specification as the basis for the API design. This latter idea was a key choice, since the SFS strikes a good balance between functionality and design complexity. Mark was confident that the SFS geometry model provided everything needed for most geospatial work, and time has proven him correct. By 2000 I had moved to Vivid Solutions Inc. as a consultant, working primarily in Java and as much as possible on geospatial projects. While there I worked on a couple of spatial projects for GDBC which were Java based (most notably, a streaming parser for SAIF, a forerunner of GML developed by Mark Sondheim and others). I was also working on various projects which utilized my C++ spatial library (including some Java-based ones, necessitating the awkward and limiting use of JNI). Howver, there was never sufficient time or budget to contemplate re-implementing the C++ geometry library in Java (and, I have to admit, perhaps not the vision on my part that this would be as useful as it has turned out. In my defense, at that time Java was still proving itself as an efficient tool for development work). Luckily, Mark did have the vision, and the access to funding. As a result, the JTS project was initiated in Fall 2000. The project goal was very clear: to develop a Java API which implemented the OGC Simple Features Specification. Given my experience and previous work, I suspect it was an easy choice to award the contract to Vivid Solutions. The project team consisted of myself as designer and lead developer, and Jonathan Aquino as a developer. The project charter did not highlight the requirement for efficiency and robustness, since Mark wisely realized that these goals would have to be proven to be attainable during the course of the project. In hindsight the need for efficient performance should have been obvious; the need for robustness perhaps less so. (JTS is not exceptional in this area - a disappointly large percentage of published computational geometry algorithms fail to address this issue.) In any case, once the basic functionality was achieved, these two aspects emerged as much more important. Even today, they are still the most important issues in JTS development. David Skea (at that time also with GDBC) contributed valuable direction and guidance. Most notably, it was his recommendation that an explicit precision model be provided, and he provided much insight about implementing robust spatial algorithms. At the outset of the project it seemed that the main challenges were going to be designing the algorithms for spatial relationships and polygon overlay. Buffering was lurking in the background with an unknown level of difficulty. Mike Butler (the "father of SDE") had warned me that buffering would be a significant challenge, but since at that time he was still under NDA to ESRI, he did not provide me with any implementation advice. Later in the project when I tackled buffering I found out how right he was! Development proceeded fairly quickly, with myself tackling API and algorithm design, and Jon working on I/O and implementations of structural methods. Jon also worked on the Unit Test facilities. David Skea contributed the core of the line segment intersection implementation, including the key development of deVillier's robust 2x2 determinant algorithm. Yao Cui of GDBC did good work on categorizing and defining test cases for the spatial predicates (which now appear as part of the JTS validation tests, a useful body of work in its own right). In the middle of the project I realized that spatial visualization would be essential for designing and debugging spatial algorithms, and I also realized that Java2D and Swing would provide a great platform to build a visualization tool. This led to the development on the TestBuilder as an important component in the JTS toolkit. Jon and I shared development of the TestBuilder. This experience was very valuable in our subsequent development of JUMP. JTS 1.0 was released in February 2002. The scheduling of this release was primarily motivated by contractual requirements. As soon as it was released I continued work on validation and buffer improvements. This resulted in the release of Version 1.1 in March 2002. At this point the contract with GDBC came to an end. I was encouraged by the success of the JTS development, and I made a personal commitment to continue to enhance JTS with better and more algorithms. Subsequent releases of JTS have been motivated by my desire to see the library grow, by bug reports and suggestions from clients and users, and occasionally by directly-funded work (notably, work I carried out in 2006 on improving the robustness of polygon overlay). JTS has moved beyond the basic SFS by providing functionality such as polygonization, simplification, linear referencing, affine transformations, and a wide variety of structural functions. One day perhaps it will even provide a true topology API ! There are many, many other applications and projects using JTS as well. In 2003 PostGIS was emerging as a serious and useful spatial database. However, there was one thing it sorely lacked - a complete set of spatial functions. Paul Ramsey and I strategized that the functions in JTS were an excellent basis for filling this gap. The big catch was that PostGIS required a pure C implementation. Never being one to shy away from thinking big, Paul proposed that we port JTS to C++. At that time Dave Blasby was still involved with PostGIS development, and it was he who came up with the name of Geometry Engine (Open Source) - GEOS. Initially the GEOS project was funded jointly by Refractions Research Inc. and Vivid Solutions, with myself as Technical Advisor (and to a limited extent Architect), and a University of Victoria Master's student named Yury Bychov as developer and designer. Since I was busy on other projects, and in any case would not claim to be an expert in the byzantine area of C++ code design, the plan was that Yury would provide any extra design needed to accomodate differences between Java and C++, and I would advise as much as possible on the purely functional design of the API. Since its initial release GEOS has been incorporated in PostGIS, of course, and also in MapGuide and apparently in at least a few other C-based projects. GEOS code has been incorporated by Safe Software in their FME product. MapServer has announced plans to incorporate GEOS in their codebase (the status of this is unknown to me). Frank Warmerdam's OGR project I believe uses GEOS. GEOS also continues to undergo development, both in the orginal mode of direct ports of JTS code, and also to a certain extent with independent functionality (primarily involving making it better adapted to C++ programming styles). When I was originally developing JTS, I spent quite of bit of time thinking about and researching techniques for efficiently computing arrangements (intersections) of sets of linestrings. There's a relatively large body of literature on this subject, as you might expect since it is such a key aspect of many geometric algorithms. As usual, however, much of this literature is fairly academic in nature, and usually doesn't address some of the more mundane issues which an implementor has to deal with. One issue that crops up with intersecting sets of linestrings is that there is a tension between increasing performance and decreasing memory use. The fastest way should be to indexing individual line segments. However, this implies creating a new memory structure for each line segment, which can be both time and memory intensive. The most memory-effective structure is of course to leave the original linestrings undivided, but this does not provide good performance. Two monotone chains intersect in at most one connected set of line segments. The envelopes of any two subsequences of a monotone chain are interior-disjoint. This means that the envelopes of successive bisections of the chain form a "pyramid" of envelopes. In turn, this allows comparing two chains for intersection can be carried out using a binary search technique using the two envelope pyramids. In addition, splitting linear geometry into monotone chains is a good heuristic for partitioning the geometry. Often digitized linework representing natural features contains quite long sequences of segments which are monotone (since the linework follows natural curved features. I was pretty pleased with my "discovery", and used it to good effect in JTS. For quite a while I was unaware of any prior use of this technique, but recently I came across a reference to a paper by Warren Burton in 1977 which apparently discusses this technique. I was led to this by the paper on Whirlpool by Nick Chrisman et al., which used this technique under the name "monotone sections". It doesn't come as too much of a surprise that such a simple and useful technique has been used before, but what I do find a bit surprising is how little this technique is discussed in computational geometry literature. I presume the reason for this is that the technique is too simple to be of continuing interest to academics, while it is too special-purpose to be worth presenting to students. There's a dearth of computational geometry literature directed at the true practitioner - which probably indicates how few practitioners there are! Burton, Warren 1977: Representation of many-sided polygons and polygonal lines for rapid processing, Communications ACM, vol. 20, no.3. Chrisman, N.R., Dougenik, J.A. and White, D. 1992: Lessons for the design of polygon overlay processing from the Odyssey Whirlpool algorithm, Proc. 5th Int. Symp. on Spatial Data Handling, 2, 401-410. One of the most useful OGC standards is their specification of the Dimensionally-Extended 9 Intersection Model for spatial relationships. (To give credit where is it due, this was originally developed by Egenhofer, Clementini and others). In its most general form this model is quite complex, so to make it usable for mortal programmers, a set of commonly-useful "named predicates" have been specified. These include obvious relationships such as intersects, disjoint, touches, equals, and contains. But are they really so obvious? In fact not - several of them have subtle aspects to their definition which are contrary to intuition. That last clause causes the trap - because of it, a LineString which is completely contained in the boundary of a Polygon is not considered to be contained in that Polygon! Its converse coveredBy is also useful as well. It's a bit of a mystery why OGC did not define this predicate. In any case, Oracle Spatial does provide this predicate. I have added it to JTS as well. All that is necessary to determine this condition is to perform a simple bounding box comparison. This is not possible with contains, because even if the bounding box of Geometry is covered by the Rectangle, a further expensive operation is required to test if the Geometry lies wholly in the boundary of the Rectangle (in which case the predicate fails). Interestingly, some recent work I'm doing indicates that this predicate might play a very useful role - but that's a story for another post. DE-9IM: Clementini, Eliseo, Di Felice, and van Osstrom; "A Small Set of Formal Topological Relationships Suitable for End-User Interaction," D. Abel and B.C. Ooi (Ed. ), Advances in Spatial Database—Third International Symposium. SSD '93. LNCS 692. Pp. 277-295. 9 Intersection model: M. J. Egenhofer and J. Herring; "Categorizing binary topological relationships between regions, lines, and points in geographic databases," Tech. Report, Department of Surveying Engineering, University of Maine, Orono, ME 1991.